Nails 4 Dummies! : Calling All Lazy Nail Bloggers!! Have you ever been tempted to join a challenge but said to yourself, "Ugh, posting every day for 30/31 days? I just don't think I could do that!" 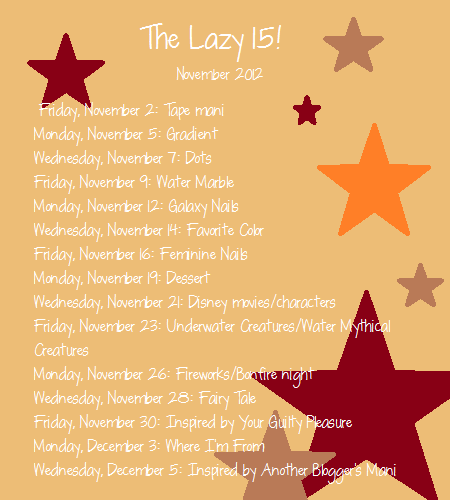 Well, never fear, The Lazy 15 is here! Starting Nov 2nd we will be starting a challenge that only includes 15 manis and is only on Monday, Wednesday and Friday! If you often feel intimidated by the art of others this will be perfect for you as well because most of us haven't tried at least a few of these! We still welcome the experienced artists as well, the more the merrier! If you're interested, just grab this inlinkz code and paste it into your blog or you can also wait and grab the inlinkz code on the first challenge day! I really hope you all give it a try and join us, it's going to be a blast!!! holy crap I'm so in! I've never done a challenge before and this sounds perfect for me! Yayyyy Fitzy! This will be a blast! Am tempted but I don't know how inlinkz works? What would I need to do? Actually, at the moment this code isn't working correctly, lol! Once we have it fixed all you have to do is copy the code, which I can send when it's fixed, and you paste it at the very end of your blog post in HTML mode and that's it! :)It's easy, I promise and I will help! Yay I'm in!! I love that it's not every day!! Works for this crazy busy mom!! Dang, I added my link on my phone and it doesn't connect to my blog - does it matter if it does? It has the right picture, I wonder if it has the right email address - who set the inlinkz up so I can see if I can edit on their page? Oh and I'M SOOOO IN!!! Yay!! It's all good Nicole! If you can't get it that's cool! :) We're laid back and lazy! I'd like to join. I was a little iffy because I have something else planned for Friday, but I figure I'll just double post that day. I'm too lazy to challenge myself otherwise, LOL.